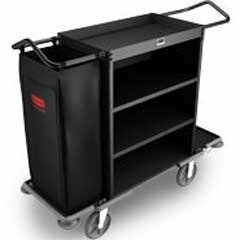 Ergonomically-designed metal housekeeping cart with attractive baked on powder-coated finish. Features a 25° bend for easier maneuverability and steering. Includes four ball-bearing locking casters. Rotating bumpers help protect walls and furniture from unnecessary damage. Ergonomic design, with attractive, baked-on powder-coated finish. Features a 25º bend for easier maneuverability and steering. Includes four ball-bearing locking casters.